A big thanks to Inna for finding this news. It looks like Libera has wowed the audience with their singing once again :). Here's what they said in the news. You can also see the news here. 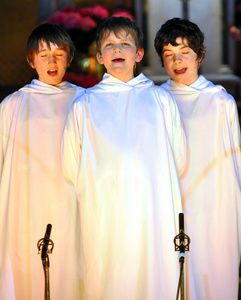 "Members of the all-boy vocal group Libera perform for a capacity audience at Church of Our Lady Sunday evening. The renowned 23-member vocal group, whose members are aged seven to 16, is on a cross-Canada tour and sang twice at Church of Our Lady on Easter Sunday." Well done, Libera. I hope you have a great tour in Canada. Please do go back there again next year for another concert :D.